During February 2003, fourteen RAAF F/A-18 Hornets flew to Al Udeid airbase in Qatar for air operations over Iraq as part of Operation FALCONER. This was the first overseas deployment of Australian fighter aircraft for combat operations since July 1953 when RAAF Meteor F8s flew their last ground attack missions of the Korean War. The Australians were airborne from the start of air strikes on 20 March and continued in the thick of the action of the air campaign until the end of combat operations on 27 April, by which time they had flown 350 combat missions and dropped 122 laser-guided bombs. Their missions ranged from air defence to interdiction and close air support and included operations with Australian SAS and Commando forces, as well as numerous missions flown in support of US Marines involved in fierce street fighting around Baghdad and Tikrit. The Hornets returned to Australia in May after one of the most successful combat deployments in the history of the RAAF. Magpies Over Baghdad portrays a pair of 75 Squadron Hornets during a close air support mission flown in support of US Marines in the vicinity of Rasheed airbase near Baghdad. The leader is tipping in to attack a target with GBU-12 laser guided bombs whilst his wingman watches and waits for his turn to attack. In the background, above the smoke from burning buildings, vehicles and oil fires, the Hornets share their ‘killbox’ airspace with a USAF A-10 recovering from its attack on the same target area whilst a pair of F-15s can be seen overhead Baghdad. 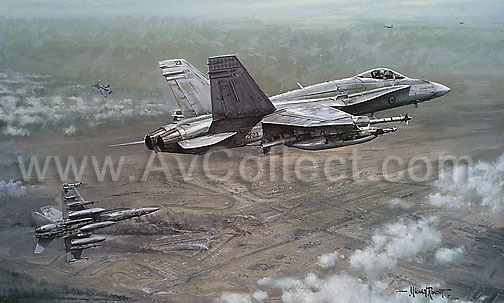 The entire scene is carefully reconstructed from the pilot's own combat reports and reconnaissance imagery taken during the battle for control of Baghdad to give the painting a unique authority and accuracy.